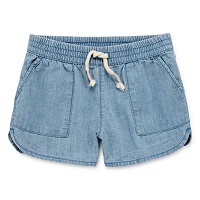 Shop kids' shorts by Nike, Arizona, Levi's, Carter's, and other brands your kid's love. 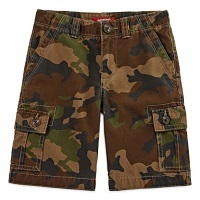 Get awesome shorts for play, school, and more for boys and girls of all ages. Your kids will move with cheetah-like speed in Nike shorts that are made from their moisture wicking fabric and feature exceptional ventilation. They'll make a strong impression in the vibrant and electric colors from our JCP exclusive line, Xersion. Xersion shorts come in a range of sizes, including husky, and are made from quick drying fabric. Arizona, IZOD, and Levi's always have fantastic casual clothing for children. Get jean shorts and cargo shorts in solid colors and plaid. 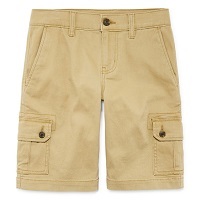 If your kids have a school uniform, then you'll have a field day stocking up on perfectly priced khaki shorts. There is no shortage of stylish chino shorts! We have an amazing selection of chinos in vivid colors, such as summer orange, Latin coral, and blue curaco. Skorts blend the best parts of skirts and shorts together. Shop for blue jean skorts, skorts with frills, and skorts with dynamic patterns! Shop cute kids' capris in styles they'll love, and prices you'll love! Yoga, track, dance, or P.E., get a pair of capris for all of their activities. Vivid colors and patterns dominate our selection of sports capris. They are all extremely breathable, modest, and ready for tough play sessions. Adorable fashion capris are great for everyday wear. We have capris made from denim and cotton. We have red hot Bermuda shorts for kids in many fun colors and designs. 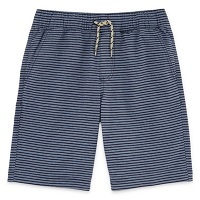 We even have knit Bermuda shorts that are perfect for P.E. or bedtime. The great thing about capris and Bermuda shorts is they are school appropriate. You won't have to worry about dress code violations! View all of the cool kids' capris and Bermuda shorts for kids in the kids' clothing department.